I found this on the interwebs.Meet Pedro Pe, LA's finest lunch truck comedian. Featured in this movie are the taco trucks Tacos El Primo and Leo's which park near the Ranch market at West adams and Redondo ave.
What is he, an Italian Taquero?! It's okay, Mexicans can't play White people right either. 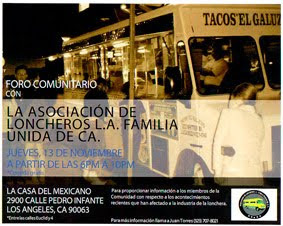 A few years back, some local Chicano (or should I say Pocho) comedians were working on a movie based on taco trucks. It never was completed though...or maybe it's still in "pre-production."